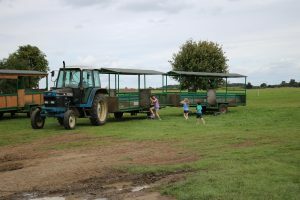 We were very kindly invited to visit Roves Farm during the summer holidays for a family day out. 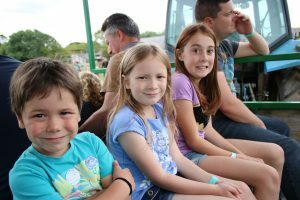 We love farm parks as the kids all love animals and Roves Farm is one we had never visited before, despite not living far away. Anywhere with animals is bound to be a big hit but with Lilian now 10 I was worried there may not be much else for her age group. I needn’t have worried – Roves Farm have got it covered! We were welcomed at reception by friendly staff and given our wristbands, programme of the days events and tractor ride tickets. 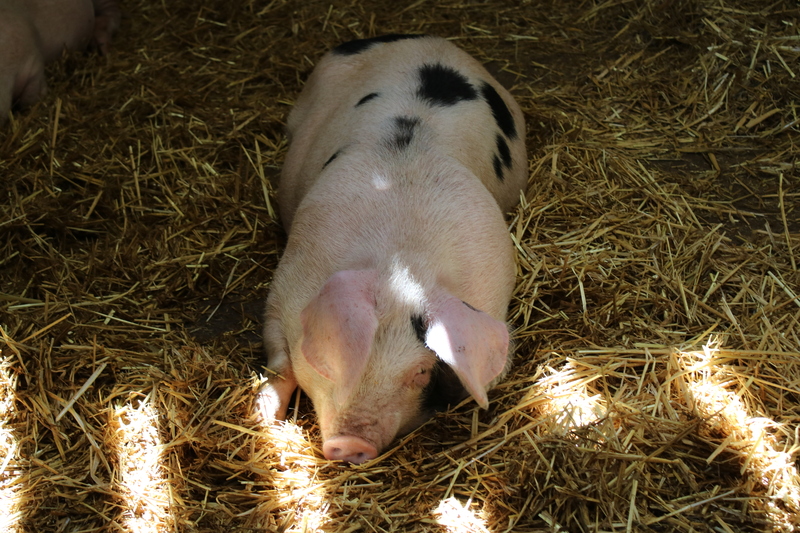 We decided to look round the animal barns first and saw lots of piglets at various different ages. It was really interesting to see the difference in size between piglets born just a few weeks apart. Next we took part in the handling sessions. The kids got to hold and brush rabbits and guinea pigs and then groom a nanny goat too. 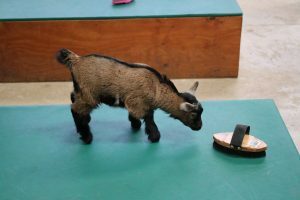 Shortly after that the goat kids were let loose. They were so funny to watch as they skipped around and played. 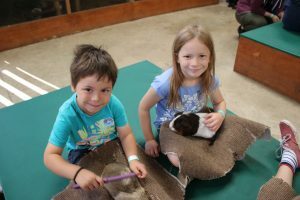 Despite it being the summer holidays it wasn’t massively busy and we were able to take our time and enjoy fussing the animals for as long as we liked without feeling rushed. In fact we spent well over an hour in there. There are various feeding and handling times throughout the day so check the timetable to see whats on during your visit. 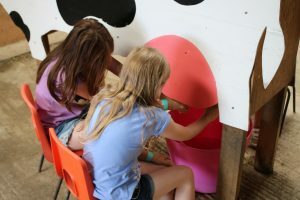 Another feature I really liked in the animal barn was the wooden cow you could have a go at milking! Next we headed outside to a fantastic playground which really caters for all ages. 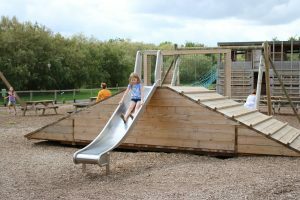 This is where most farm parks fail in my opinion as most play areas are aimed at younger children but Roves Farm have really catered for everyone here and it was great for our family with such a wide age range. 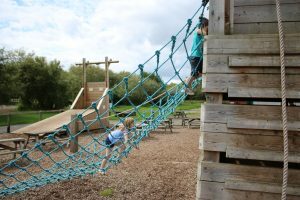 The bigger section has a tree house style play frame with quite challenging rope ladders and climbing walls which are not for the faint hearted! There is also a zip line and slides. The smaller area aimed at younger ones was similar but with easier challenges for little people to enjoy. 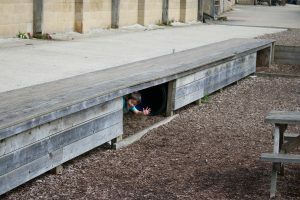 Cody really enjoyed the secret tunnels he found under the walkway between the 2 play areas. 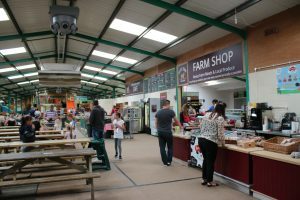 After a good run around outside we headed indoors for lunch in the huge barn which houses the cafe, farm shop and indoor play areas. 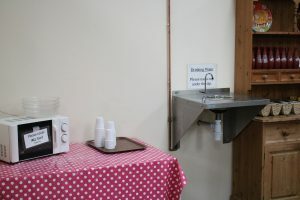 We were really impressed with the facilities which included a free water tap and microwave to heat up baby food/milk. There are loads and loads of picnic benches so you won’t be short of somewhere to sit and you can see the kids playing on the play frame from your seat. The toilets had loads of baby change units and toilets/sinks at child level as well as adult level. There were steps at the sinks and several pottys to use. Everything was so well thought out and I find its these little details which really do make the difference when out somewhere as a family. Danny ordered a burger from the specials board with chips and I had the Roves Farm sausage and chips from the main menu. Both of our meals were a good size and the quality of the meat was gorgeous. So full of flavour and fresh from the farm. We felt the prices were very reasonable for what we had and we would definitely eat there again. Unfortunately I was so busy enjoying eating I forgot to take pics of our meals! There is a separate childrens menu available too. I thought the lunch box deal which includes a sandwich, bag of crisps, fairy cake, fruit AND a drink was good value for money at £3.90. 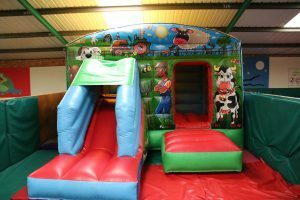 The big play area at the back of the barn has separate areas for under 5s including a bouncy castle, ball pit and soft play. There is then a rabbit warren and slides, etc on the main play frame for older kids. You can purchase glow sticks to wear in the dark rabbit warren from reception which makes it really fun. Be aware kids must wear socks on this equipment. Lois was wearing sandals that day so didn’t have any on but there are loads of pairs available to buy from reception in different sizes if you forget to take some. One thing a lot of people didn’t seem to realise (and neither did we until I noticed some people disappearing round the back!) 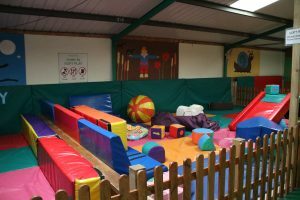 is that to the right hand side of the play frame if you follow it to the back of the barn it actually leads into a second huge play barn with an even bigger soft play area and indoor pedal kart track! This was almost empty as people simply didn’t know it was there! 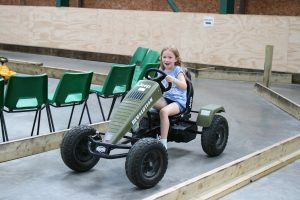 We absolutely loved the pedal karts and there were art and craft activities to have a go at too. After lots of fun in the play barn we headed outside to watch the sheep racing which was good fun. We placed bets to see which colour would be the winner. From there we jumped on the tractor trailer ride off to Neverland! 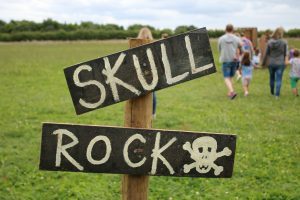 Once we arrived at ‘Neverland’ we were met by Peter Pan who took us on an adventure through the woods to find the treasure at Skull Rock. The kids loved this and it really added another dimension to the normal tractor rides you see at farm parks. We haven’t seen one like this before! The theme changes on a regular basis so you are bound to see something different each time you visit. So what did we think of our day out? We’ve been to many farm parks over the years and I have to say this is one of the best. 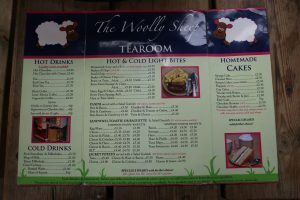 Roves Farm caters for all ages which is something we really struggle to find as most are aimed at younger kids. 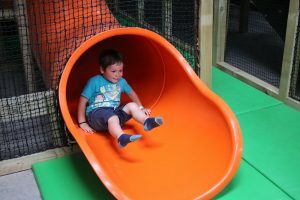 The huge play barns are a fantastic addition to the usual animal activities plus the adventure tractor ride which was totally different to anything we have ever seen before was great. Our kids are desperate to go again and I would be more than happy to revisit as we had a great time and could easily spend all day there. I couldn’t fault this place. We highly recommend it!